Follow Post 92 Pigskin Classic Fantasy League! Here are some final notes before the draft…. What’s your team name? If you come up with a name before Friday, we can help you create your own helmet, if you like! Or, ESPN has a variety of images so you can make one on the fly! This can all be done when you log into your team on the ESPN site. Owner Fees are due on Draft Day by 1PM.There is an envelope at the bar or see Barbara R (treasurer) to pay early.Please, just make contact if you are running late to confirm. 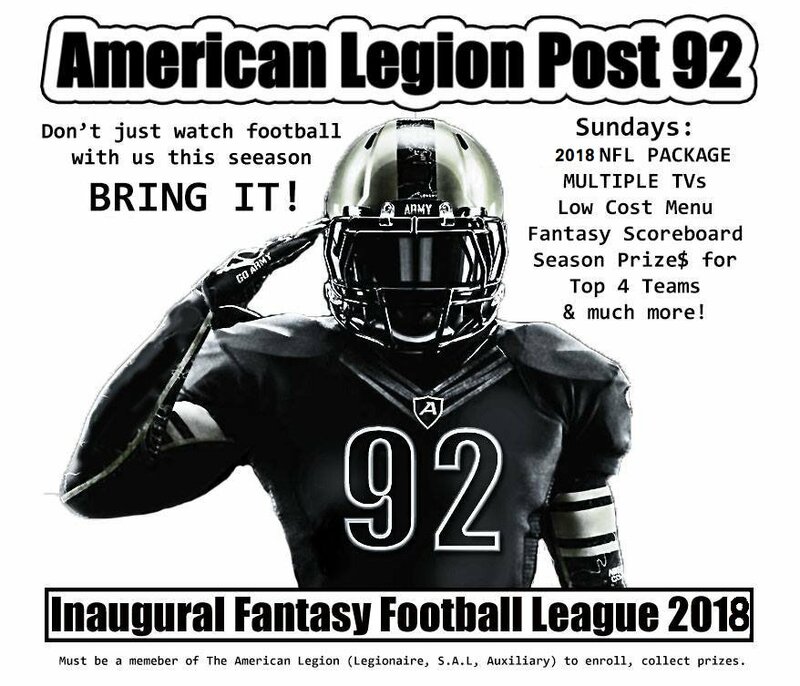 If for any reason you will not be participating, it is important you let us know, at least, 2 hours before the Draft so that we have time to re-structure the league in the computer and the draft can go on as scheduled. There will be a $20 PENALTY for any owner that causes the draft to be delayed and/or your team may be forfeited. “Auto-selecting” Some owners are going to let the computer do all their drafting and weekly matchups for them, this year. I added myself as a co-owner to those teams just to make sure the draft and week 1 matchups run smoothly for them, as this is our first year with the espn software. 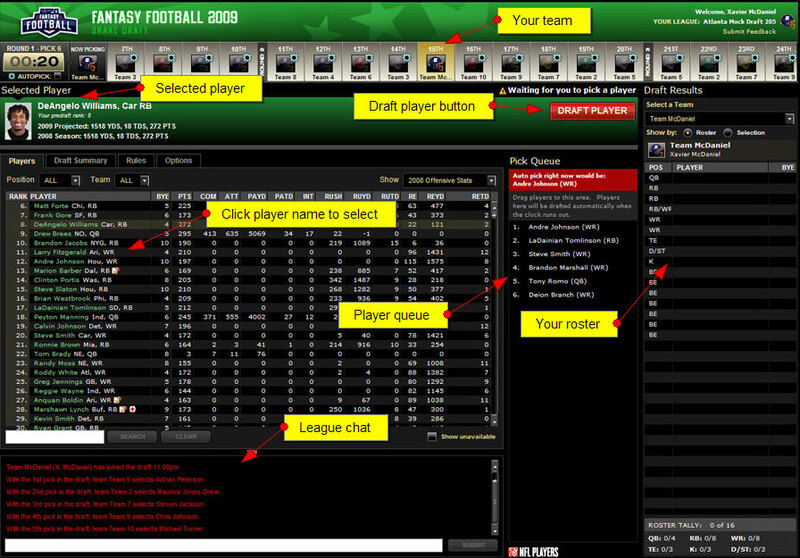 The ESPN software makes a ‘suggestion’ of who your team should draft when you are ‘on the clock’ (90 seconds to choose). If any owner fails to make a selection in that 90 seconds, the top suggested player is automatically chosen. To speed up the draft a bit, the teams that have committed to auto-selecting, we will just go ahead and select that player without waiting the 90 seconds. If you are doing your own drafting (AWESOME! ), remember, don’t just plan on picking the players you want because they might not be available if somebody else gets them before you! 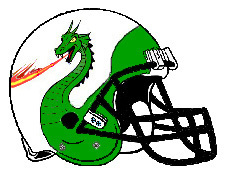 We will be selecting 2xQB, 3xRB, 4xWR, 2xTE, 2xTeam Defense/Special Teams, and 2x Kickers. That’s 15 selections you will be making in the draft! So for example, with 12 teams…there will be 24 quarterbacks selected overall in the draft. Therefore, your list of QBs to select should be at least 24 names long in the order you think they are valuable! Hint: you cross off the players you didn’t get as the draft progresses. If you have any questions or want any guidance about drafting, find Fernando around the bar. He has been playing Fantasy football for decades and is a great source of knowledge on draft strategies. Post 92 opens at 9am Sunday. If you have any questions, want to make any suggestions, need help, come in before the draft. Chris Holden and S.A.L. are going to have the kitchen open with a special selection for our draft. The first NFL regular season game is Thursday, Sept 6 (Falcons VS Eagles). I’m not sure if it is necessary to do a blind bid this first week, before that. Will get everyone’s consensus. However, if you have drafted players on either the Falcons or Eagles, your first games will begin! So I will get post-draft info out on how matchups work by Monday or Tuesday. Finally, join us for the DRAFT AFTER-PARY…7:30 PM #8 Miami Hurricanes -vs- #25 LSU. This entry was posted in Fantasy League 2018-19 on August 29, 2018 by chris.